I am humbled and totally mesmerized by the look of the other dolphins watching from inside the tank, wonder what they are thinking, what would they ask us?? I ask myself, how did this happen? For entertainment or important research? Sadly, the reality is most certainly greed. We hope you remember this video when going or taking kids to be entertained by captive wild creatures whether cages, tanks or in tourist boats. 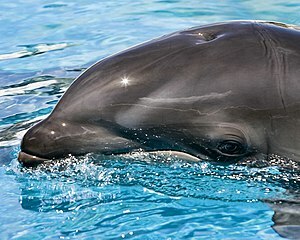 The risk for dolphins and other creatures are broken spirits and dwindling populations. I would suggest watching the movie The Cove also. With its graphic and dire scenes of slaughter, you can see and hear the real life consequences for dolphins who have become a commodity. There are positive alternatives, you can give a donation in your family, friends or kids name! What if you take the cost of admission to a water park or boat trip and donate to organizations that are protecting these magnificent creatures? What a great holiday gift! So much positive can come from teaching and learning to do our part to save not enslave the earth’s and ocean’s vulnerable creatures. All of us at Ocean Girl Project sustainable surf camp are doing all that we can to inspire, educate and uplift in the spirit of honoring sustainable life in Hawaii and in our ocean. We offer this all children, regardless of ability to pay. Up until 1995, spinner dolphins were found in particular areas on a daily basis in pods of 65-70 animals. Today, in these same areas, they are present only a few days out of the month and the pod has shrunk to an average of 35 animals. This disruption appears to be caused by intense and unregulated visitation by dolphin tour boats. Where ever and however you choose to give this holiday, please consider helping to save ocean creatures from harm and doing all that you can in keeping our oceans plastic free. Mahalo!